How Many Ads to Pay a Writer? Amid all the upheaval in the media business, one fact has remained constant: Most companies that sell advertising against content still need to pay people to create it. In most cases, those people are still writers. And one of the most underreported changes in the business in recent years is how many — and in some cases, how few — ad impressions it now takes to pay your typical writer. 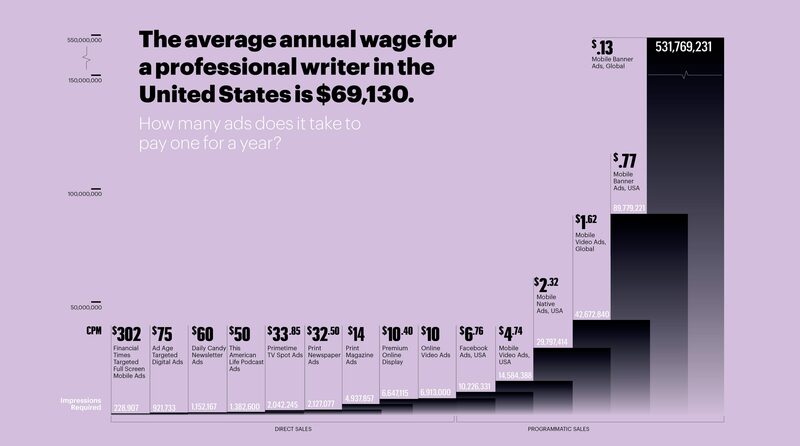 The average American writer makes $69,130, according to U.S. government statistics. To hire one, the Financial Times, which has some of the highest ad rates online, needs to generate just 228,907 impressions of its most expensive digital ad unit — a targeted mobile ad with an eye-popping CPM of $302. The next ad tier down from the Financial Times includes trade publications, high-end newsletters, and premium podcasts that target readers in niches coveted by specialty advertisers. They only need about a million ad impressions to pay a writer for a year. TV ad rates are much lower, but the audience for television is far larger. The average prime-time TV ad targeted at a particular metro region goes for a $33.85 CPM, according to an analysis of ad rates by investment bank Peter J. Solomon Company. At that rate, one ad on “The Big Bang Theory” — the top-rated prime-time show, with an average of about 14 million viewers a week — would pay seven writers for a year. Most TV advertising is nowhere near that lucrative, of course; outside of prime time, network TV sells ads for an average CPM of just $6.92. The big question in the advertising business is this: How soon will the ad dollars that now go to TV move to the online world — and how much will they be worth there? Online video ads sold directly by websites had a median CPM of $24.60 when Peter J. Solomon Company started tracking rates a few years ago. But that number had dropped to $10 when the investment bank updated its figures earlier this year. That’s not so surprising — the supply of online video ads is skyrocketing. But it means the number of video ads it takes to pay a writer has gone from about 3 million to nearly 7 million. That’s nothing compared with the audience needed to pay a writer using programmatic ads, though. At the top end of the programmatic scale is Facebook, which would require roughly 10 million impressions to pay the average writer’s salary. At the bottom end are mobile banner ads — to pay a writer it would take more than half a billion of them, sold at the average global effective CPM of 13 cents. At those rates, a publisher would need to produce 14 articles as popular as the most-trafficked post in BuzzFeed history to afford a single writer. With numbers like that, even the online giants would have a tough time staffing a newsroom. DATA SOURCES FOR CHART: TRAFFIC REPORTING, PETER J. SOLOMON COMPANY’S “THE MEDIA MONTHLY,” MEDIA KITS, ADWEEK, SALEFORCE’S “FACEBOOK ADS BENCHMARK REPORT,” APPODEAL. We will be publishing our readers’ best feedback and incisive dissent; send your thoughts to feedback@trafficmagazine.com. Click below for a complimentary copy of Traffic’s latest edition.